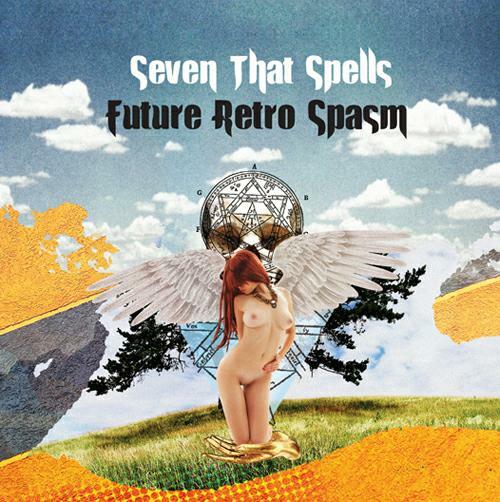 Seven That Spells - "Future Retro Spasm"
Before about a year ago, I'd never even heard of this space rock / psychedelic band from Zagreb, Croatia. I just happen to stumble across one of their CD's when I saw that Acid Mothers Temple's guitarist Kawabata Makoto had guested on a title of theirs. First time I heard this 'Future Retro Spasm' import CD, I noticed they had axed the synthesizer for a saxophone for the entire disc. Not that it's a bad thing - mind you, it's simply that this particular CD isn't quite as out-standing as a couple of other STS discs that immediately came to mind - 'It Came From The Planet Of Love' ('06) or the totally brilliant 'The Men From Dystopia' ('07). But it's still good. Thought that the first three tracks "Olympos", "G" and "Terminus Est" brought to mind 'You' era Gong. Wanted to note that the fourteen-minute space-rocking epic "The Abandoned World Of Automata" is most definitely worth the price of admission alone. The nine-minute "Death Star Narcolepsy" sort of maybe reminded me of mid-'70's Guru Guru and the closer "Quetzalcoatl" has plenty of top notch sax playing - most likely appealing to fans of Nik Turner, Niels Van Hoornblower (Legendary Pink Dots) or even Jack Lancaster in his days with Blodwyn Pig. Line-up: Niko Potocnjak - guitar, Narantxa - bass, Lovro Zlopasa - sax and Stanislav Muskinja - drums. Comes as a limited-edition of 1,000 copies housed in a custom-made book bound sleeve. Recommended for fans and devotees of early Gong, Acid Mothers Temple, Acid Mothers Guru Guru and Amon Duul II. Sure, all of what Seven That Spells is doing here - has been done many times before, but I've been more than happy to add the group to my 'frequent bands played' list. Hopefully you will too.